You are energy. You can’t have energy or not have enough energy because it’s not about having or not having. You are energy. For the rest of this month, we’ll be exploring this fact. Every talk/meditation is intended to help you realize that, at every level of body/mind/ spirit. I chose the image above because it represents the stillness from which movement arises. 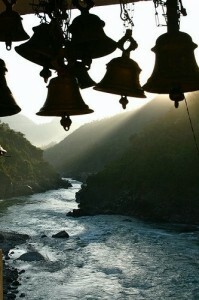 There is energy in the stillness of the bell, energy in the striking of it, and in the resonant sound that arises. Every moment, every thing, every breath, is filled with energy. In listening, in stillness, we enter into an awareness of pure energy that nourishes and sustains us when we emerge into movement and activity. I recorded this outside, and you’ll hear the ravens and other birds participating, an occasional rustle of paper, and the echo of the wind that was non-stop in New Mexico for all of March, April and May. It’s all energy. Enjoy, and please feel free to share questions, insights, experiences through comments on this post. And for further experience, please see my book The Vibrant Life: Simple Meditations to Use Your Energy Effectively, Sentient Publications 2006.